generic image of the wind speed can be drawn from maps such as Fig. 6.11. At lower heights impediments of greenery and buildings define wind patterns and its strength, which can locally be accelerated or extinguished. very different in the morning and afternoon, but with a predominant occurrence from the north-west. Since this is where the outback desert can be found, this wind brings drought and heat in summer and freezing cold at night. Hence, an example of wind to be obstructed although some of it can be useful for cross-ventilation of urban areas. Table 6.1 gives the potential yield at different wind speeds per unit of area (km2 or hectare, with a rotor diameter of 50 m) or per m2 of rotor area (the circular area of revolving rotors). 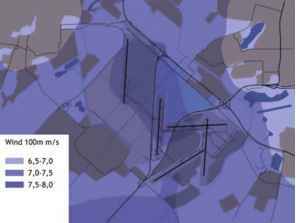 As can be seen, planning turbines at the most appropriate locations (9 m/s on average versus 7 m/s, which is not to bad either) rapidly causes differences in yield by 70%. 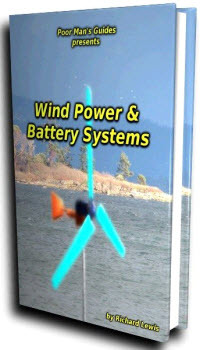 High wind turbines require adaptation of the low-voltage power grid and upgrading of transformers, or a direct connection to the medium-voltage grid. 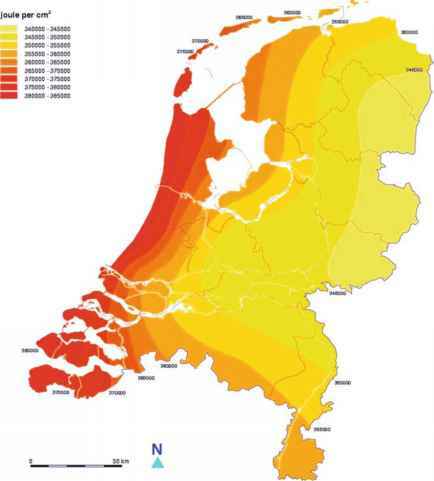 Therefore, the presence of the medium-voltage network defines the potential of solitary large wind turbines. For wind parks a separate connected is usually arranged for, which economically is more feasible. 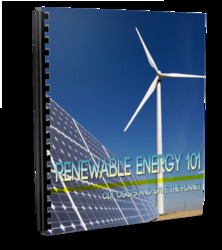 Just as with solar energy, decentralised generation of wind power enables becoming energetically self-sufficient. Some smaller turbines that are suitable for the built environment - such as the Turby - can produce the annual amount of electricity needed by a household if they are installed at favourable positions.